In earlier exhibits we have reviewed and compared some of the fundamental ways in which the Yolngu and European Australian cultures assign meaning: by classifying, by patterning and by signing. Such meanings gain authority by being recorded in texts, a process which also makes possible their wider dissemination. By looking at texts and the circumstances of their production we hope to illuminate some facets of the knowledge-power networks that meet in ganma. We shall limit our examination of texts to those concerned with one plant, the Cycad, a Palm-like tree that occurs in eucalypt forests around most of the coastal perimeter of Australia. Yolngu people produce texts about cycads in several forms: dance sequences, songs and graphic representations. Westerners produce scientific texts about cycads. If we wish to compare Western and Yolngu texts, we are immediately confronted with a problem of asymmetry. No part of any of the Yolngu texts which focus on cycads can be extracted and printed in a book like this. There are several reasons for this. It is, after all, impossible to reproduce a dance, even in extensive photographs. Furthermore, the most important texts in Yolngu life are produced as part of buŋgul, a term which is loosely translated into English as 'ceremony' or 'business'. Buŋgul is a highly structured time set aside by several associated clans; a time separated from ordinary life. The texts produced in buŋgul-material texts such as the making of ŋathu (bread), graphic texts such as paintings on rock faces or bark or wood, narrative texts such as song, dance and story-are corporate products of the involved clans. They are not associated with individuals. They have limited life and arc produced for a limited audience. Cycads have been a focus of ceremonial life (or buŋgul) for millenia in the Laynhapuy. The fruit of the cycad is used to produce ŋathu. Although bread is not usually construed as text, there is a powerful sense in which the ŋathu, baked in ceremony, is itself a text. Yolngu people will not allow images of the texts they produce about cycads to be reproduced. They say the texts are not context free; the texts are not 'outside' knowledge. Such texts are accessible only to particular people at certain times and places. The only exception concerns photographs of ŋathu itself. And so, as a way of solving the problem of being unable to present texts here, we have printed one photograph (ITEM 6.1) showing the context of text production, and a series of photographs (ITEM 6.2) and instructions (ITEM 6.3) which relate to the techniques used in the production of ŋathu. An early morning camp in an inland Yolngu wäŋa (owned area of land) in NE Arnhemland. What is foreground and what is background? Are the cycads the background of the people, or are the people the background of the cycads? Photograph: Neville White, 1971. The photograph (ITEM 6.1) is a record of a particular involvement of some Yolngu people with cycads. It is possible for all to view this. Although it is not a text which has been produced by Yolngu, we present it as a text which Yolngu feel properly evokes something of the truth about cycads, fire and human life. The photograph, taken in 1977 by Dr Neville White of LaTrobe University, records an inland camp on the Arnhemland plateau. From our point of view the photograph is useful because it provides clues about the texts we cannot view. We must acknowledge that it is not a neutral or objective evocation. It is framed, in a very literal way, by Western photographic traditions and by the text within which it appears. However, it is not an intentionally staged scene. We see here a naturalistic, non-idealised evocation. Something in the light which imbues the picture suggests it is early morning. In this still sleepy camp, all elements of nature – social and the non-social, the living and the non-living – blend. What is foreground and what is background is not immediately clear. Are the cycads the background of the people or are the people the background of the cycads? Are the people the background of the smoke drifting in the dew-laden air? Are the people naturalised, or is the landscape socialised? What is the difference between these two notions? We must use this picture to imagine the texts which Yolngu produce about cycads. Think of the night which preceded the taking of this photograph, and of what perhaps will follow. Notice that the woodland has been recently burned. 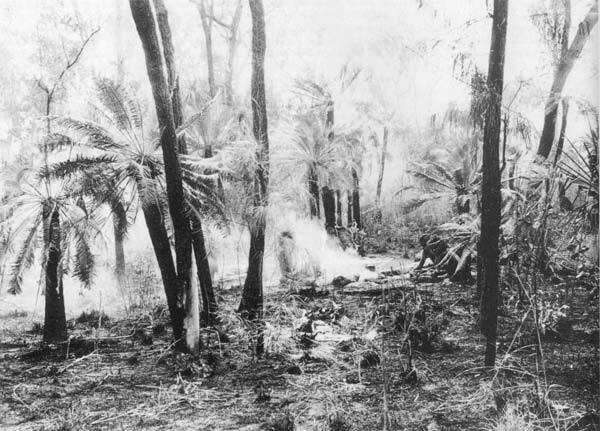 As the seeding of the cycads is brought on by fire, burning is an agricultural technique. People have come here for a specific purpose – to tend the cycads, to burn and to sing, to tell stories and perhaps to dance. By thus retelling narratives they recreate the investment of this land in their set of people. People here are at home. Imagine their talk, in which they necessarily and always draw attention to relatedness. The place, the plants and the people in this photograph are kin. They know that they and this place are located in a network of relations, and they can articulate those relative positions in an orderly fashion.